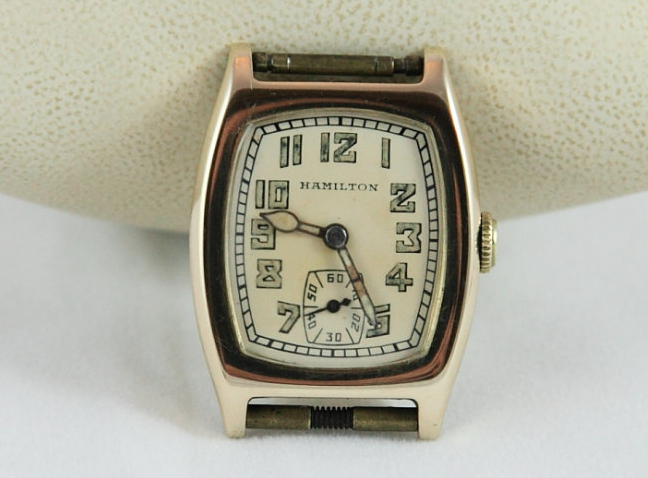 In 1930 Hamilton retired most of the original geometric models and introduced a bunch of new replacements that would be made for the next few years. 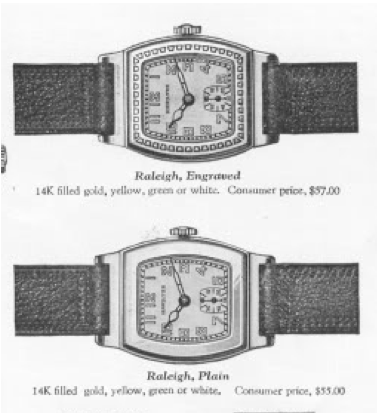 One of the new models was the Raleigh, produced through 1932. The Raleigh came in all three gold filled options, green, white or natural yellow. 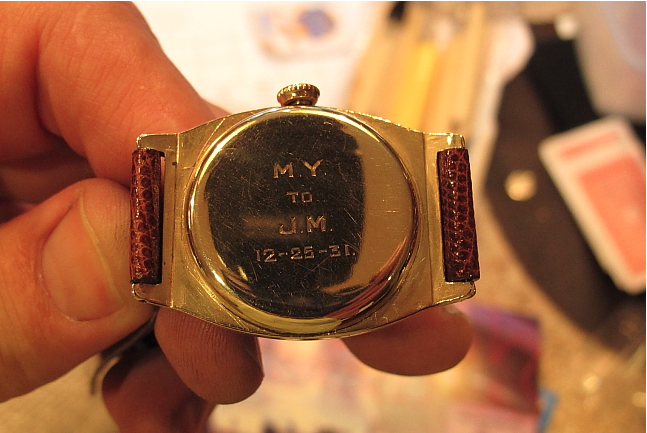 It came with a luminous dial or with an etched numeral dial. Models came plain or engraved. I recently acquired a Raleigh Plain for my personal collection that was in need of some TLC. As received, it was in decent shape, with a little wear through on the corners and a lot of gunk in the crevices of the case. One of the things I liked about the watch was it's a Christmas watch... although it's a little hard to tell in it's dirty state. 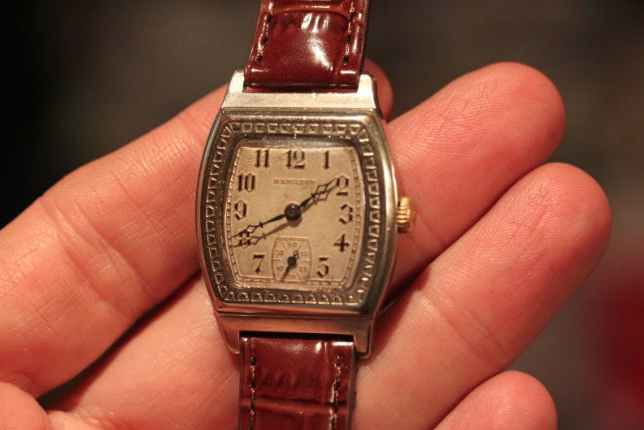 I have a real soft spot for Christmas watches - sort of a "Glass Menagerie" kind of thing I guess - especially during the height of the Great Depression. 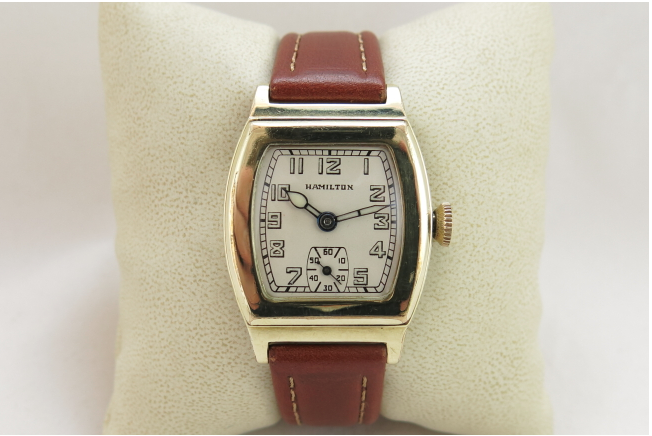 The giving of a watch like this was a big deal back then. The 17 jewel 987-F is the standard movement for this watch. 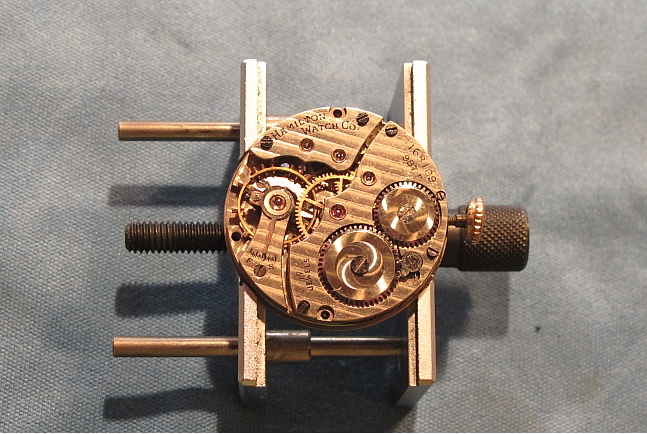 The F is for Friction - as the jewel setting are pressed into the bridges versus being held in with screws on the standard 987. You'll also see a 987-E. Although you might guess the E came before the F, in actuality it is the opposite. 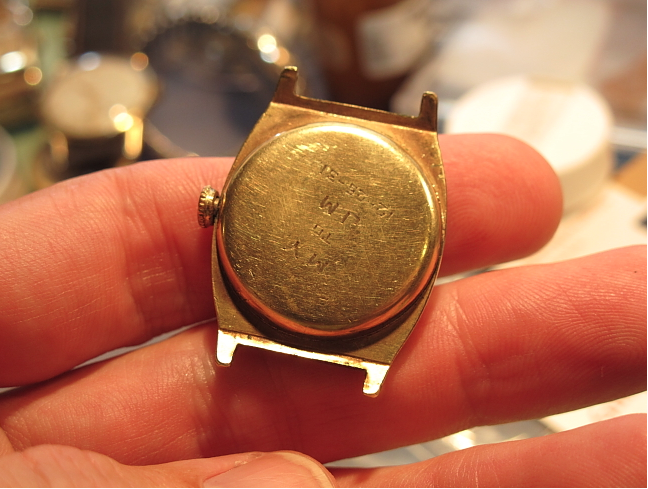 The E was introduced a few years later as the E stands for Elinvar - Hamiltons "new" hairspring material. Otherwise the E and F are identical. 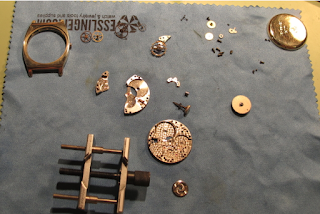 All cleaned up and drying, everything is about ready to go back together. Now reassembled, the Raleigh is ticking away and doing it's thing. 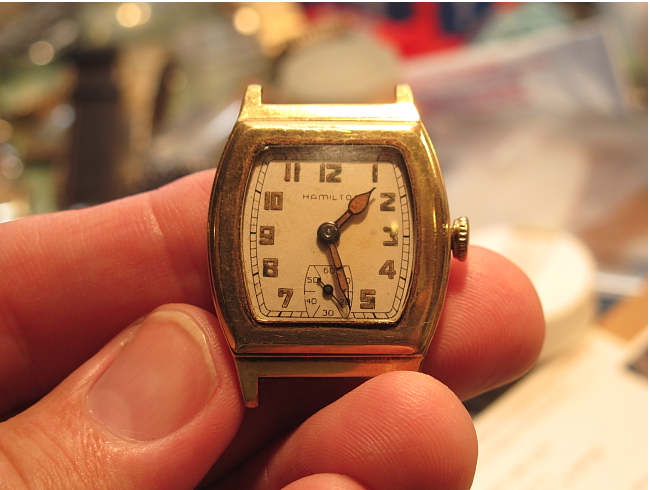 It's a sharp looking watch, sometimes called "the poor man's Langley" as it's very similar to a solid gold Langley. Here's a photo of a Langley for comparison. If you've got well trained eyes you'll note the dial on my Raleigh is an incorrect refinish. The tell is the Hamilton name is the incorrect font for this time period - otherwise it would look pretty good. The correct font is a serif font (like on the Langley), where mine is sans-serif and correct in a later years but not for this time period. Purists can be pretty annoyed by small details like this. I think it's not bad enough to refinish but I would agree a correct luminous dial with matching re-lumed hands would look better. Here you can see MY and JM's affection continues to last and will hopefully do so for another 80 years. UPDATE: I decided to get the dial refinished so that it would look entirely correct. A Raleigh with such a nice case as this one deserves to look as good as it can. 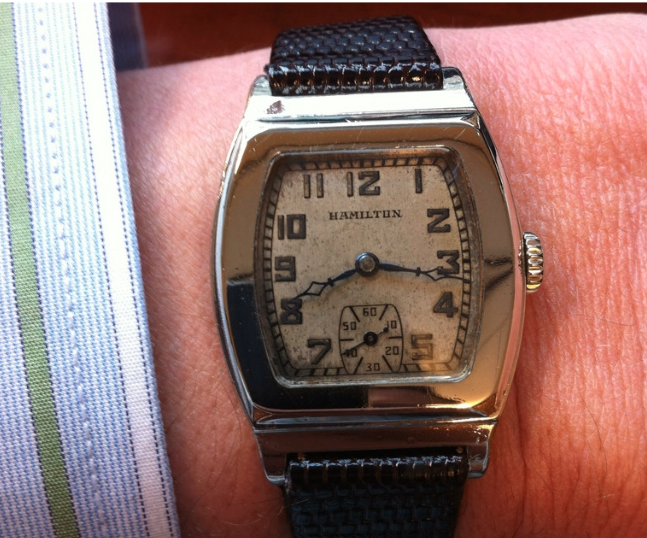 Here's a wrist shot of another Raleigh Plain I have. 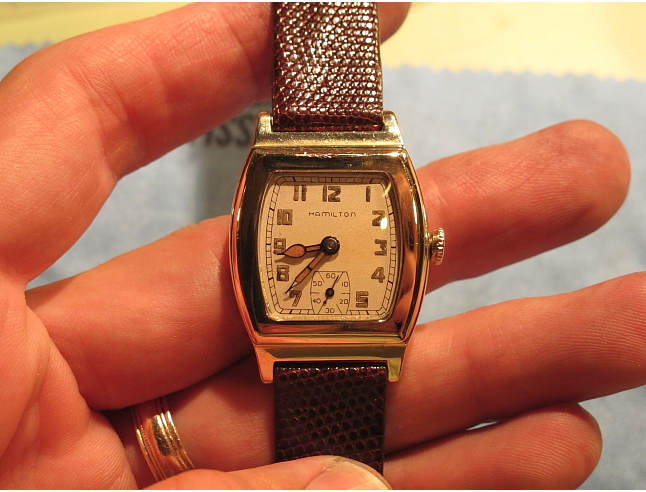 This one is in a white case with an original lumed dial but the incorrect hands. Note the font used for the Hamilton name. I think it looks cool like this so I haven't bothered to redo the dial and get matching new lumed hands. I think new lumed hands on an old dial stand out like new shoelaces on old sneakers. Someday I'll redo it though ... maybe. Finally, here's an example of a Raleigh Engraved with the Etched Dial courtesy of fellow Hamilton enthusiast, Dave McCamon. I think those old watch boxes are interesting. Especially when they come with the watch! The boxes are labeled with the number of the movement and the case number, as is the warranty card inside - so if they all match then it doesn't get more original than that! 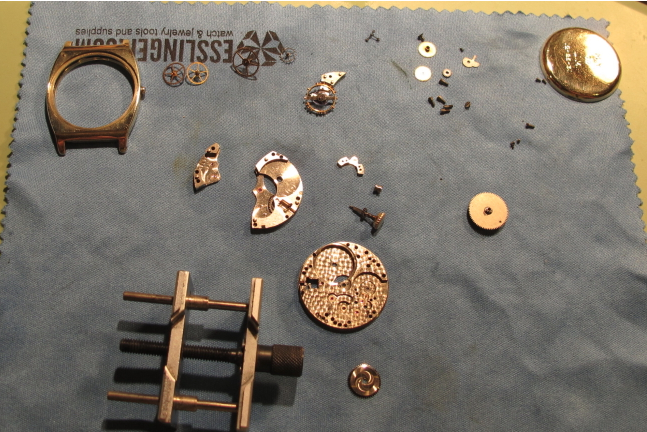 Dials can be professionally refinished for ~$55 or less so get the watch with the best case. Everything else can be restored. Hey there, I stumbled across your blog trying to find out what font Hamilton uses for their logo currently. Would you happen to know?